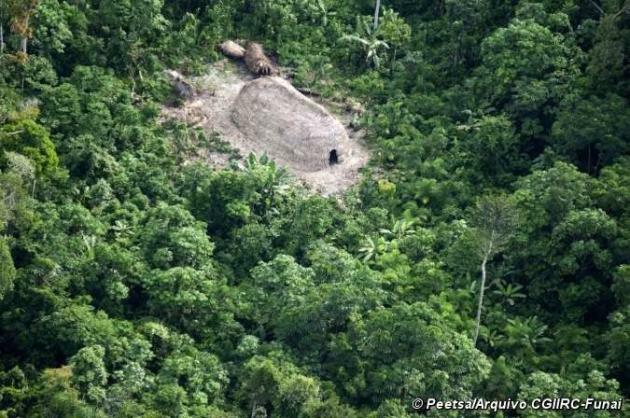 "Brazilian authorities say they have pinpointed the location of a community of ancient and uncontacted tribespeople in one of the remotest corners of the Amazon rainforest. Fabricio Amorim, a regional co–ordinator for Brazil's indigenous foundation, Funai, said the indigenous community had been found after three small forest clearings were detected on satellite images. Flyovers were carried out in April, confirming the community's existence. Four straw–roofed huts, flanked by banana trees and encircled by thick jungle, can be seen in photographs taken during the flyover. The community is likely to be home to about 200 people, probably from the Pano linguistic group which straddles the border between Brazil, Peru and Bolivia, according to Funai. Amorim said the region – known as the Vale do Javari – contained 'the greatest concentration of isolated groups in the Amazon and the world' but warned of growing threats to their survival."